It wasn’t really about the fact that Chelsea thumped Arsenal 6-0 to further extend their lead atop the EPL, It wasn’t really about Arsene Wenger’s 1000th game in charge of Arsenal, It was really about the fact that the ‘only one’ proved and confirmed that Wenger was a ‘specialist in failure’. These were not the things that made the outcome of such a big game. What would be the outcome of the match? It had to be refereeing. Refereeing has been at one of its low this season in the EPL. There have been wrong decisions that have cost teams games at vital moments. Such vital moments have affected some of the title chasers. The race for the EPL crown in May is hotter than ever before and the last thing you would want to see is an error that would be costly in an important game. Refereeing is meant to be fair, after all FIFA has a slogan that says ‘my game is fair play’. The banners displaying that message are rolled by children when teams playing in a FIFA organised match walk out of the tunnel before kick-off. That slogan seems to apply to players but I believe it should be extended to match officials too. Referee Andre Marriner’s decision to wrongly send off an innocent Kieran Gibbs was shocking and has got to be the worst refereeing decision ever. Where were his eyes when Oxlade-Chamberlain did the handball? He looked confused when he got to the scene. He confronted the linesman over the matter but I wonder what the linesman was looking at too when Ox did the handball. 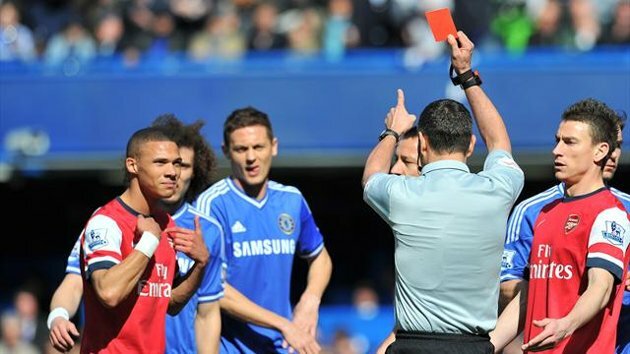 After much confusion in Marriner’s head, the confusion led him to showing Gibbs a red card. Gibbs points to himself with the body expression of “me? What did I do? I didn’t do anything”. Lets forgive Marriner for being confused at the moment but the guilty man Ox who was not worthy of also worthy of a sending-off too but a yellow card, in the spirit of sportsmanship and for the love of the game and fair play, told Marriner “I’m the one, not Gibbs”. Shouldn’t Mariner have reversed his decision but maybe because he sees himself as one of England’s top referees feels he got it right when he was actually confused. He then apologises after the damage had been done and to top it up, he doesn’t get any punishment from the FA but gets to take charge of the EPL clash between Southampton and Newcastle this weekend. The actions of Marriner make wonder what refereeing is turning into in the EPL. They make wrong decisions yet they are not sanctioned by the FA. It enough talk of referees are humans and make errors. If that’s the case, players too are humans when they make errors of going into tough challenges that are not intentional. Players won’t be forgiven but the referees will be for making the wrong decision. What makes it worse, you can’t criticise the referee. I don’t seem to understand the immunity that referees are enjoying. They seem to have more immunity than diplomatic missions. If diplomatic personnel are given ‘persona non grata’, it means the person is not suitable for the job and is relived of his/her duties because of some faults. I’m not saying referees should be relieved of their duties for making bad decisions, but the FA should be able to look into the issue and give them a little punishment for making wrong decisions. I don’t see why managers and players don’t have the right to speak their minds about a referee’s decision. What protections are the referees getting that will warrant a manager not to speak his mind? Maybe the managers can be harsh with their words sometimes such as Brendan Rogers when he criticized referee Lee Mason in Liverpool’s Boxing Day 2013 defeat to Man City over numerous errors in the game. The highlight being Raheem Sterling wrongly ruled for offside. Rogers afterward said “I thought they were horrendous in terms of performance. I thought it was throughout the evening. Hopefully we don’t have another Greater Manchester referee again on a Liverpool-Manchester game. I was surprised we are playing in Manchester and have a referee from Greater Manchester. I am sure we won’t get (for) Liverpool-Man City someone from the Wirral.” It’s out of disgust of poor decisions made by the referee that Rogers made this. If a poor decision by the referee is human then a reaction from the manger/player too is human. I don’t think you expect a wrong decision to be made and you will look at it go by without challenging it. That sounds awkward. I haven’t seen excuse that can be given to justify why referees just go away with wrong decisions and the FA doesn’t look into it. It is costing teams dearly. So maybe the game is not fair as FIFA says. Football is not fair at all. It’s one of the most bias sports and why? Because there is no means of evidence to support a dispute during the game. Goal line technology which is highly expensive has been introduced to allow referees make the right decisions of whether a goal has crossed the line or not. That is good but not every league in the world can afford to install the system. Beside it’s not only wrongly or rightly given goals that make up the bad decisions. That is just less than half of it. What about the wrong offisdes, the wrong awarding of reds and yellows and the wrong spotting of a foul or handball? These make up about 90% of wrong decisions referees get away with and why isn’t anyone looking into the matter to make refereeing better? The good part of all these is we learn to live by these many mistakes and move on. It’s not the end of the road after all but must such continue? If football wants to be fair with refereeing decisions, there is a simple solution to it and that is video replay. It is only those who watch the game on TV that know if a decision is right or wrong because the scenes are replayed, paused and slowed down. The video replays are used after the match but I wonder why it isn’t used during the match? Why after when the damage is done? Well I guess it is because the game will be slowed down if such is done. This simple use of video technology is used in sports like Tennis, Rugby, Cricket among others. Such has made decisions to be fair. If football can’t adopt this simple and cost effective technology that can be used all across the world, I guess football was never meant to be fair as FIFA says and we shouldn’t complain about a referee’s poor decision and accept it. Football is not fair and that’s that. But come to think of it, if football was fair and less controversial, there won’t be hot debates and nothing really to write about. The fact that the other games that have fair decision making systems makes such games boring but because football is highly controversial and unfair, there is always much to talk and write about hence the money that is made across the globe and the popularity football has. In that case I guess football stays unfair and controversial led by the referees so it can all be more interesting. Is Bayern Munich really under Pep Guardiola’s control? Football is not fair, likewise life…interesting piece! Good one Kunle. Please add your personal picture to your profile as a blogger.